Let’s face it, life is, well…busy. It can be hard to manage school, jobs, children, partner, pets, time with friends etc. & maintain a healthy lifestyle. While I am no longer a student & don’t have children, I do often work 6 days a week (when I am not on summer vacay – yay!) & try to squeeze in yoga/gym/decompression time in the evenings. That often leaves me at 8 o’clock at night scrounging through the fridge trying to put something quick & easy together. When weekends allow, I like to “bulk cook” so I’ll have leftover meals to quickly heat up, I’m about to work weekends again, bulk cooking isn’t always possible. Sometimes, I’m so tired & overwhelmed I don’t eat dinner at all, other times I’ll stop at the market for my quick go-tos – usually a frozen pizza or Amy’s Rice Mac & Cheeze. While it’s vegan, it’s not optimally healthy food. In a perfect world I’d eat fresh, non-processed whole foods at every meal. But last time I checked, it’s certainly not a perfect world. Yet, in the world of “convenience foods,” I will say it’s getting better. At Veestro, our goal is to make healthy dining conveniently accessible to you & your family. We provide high-quality, plant-based meals that you can feel good about. 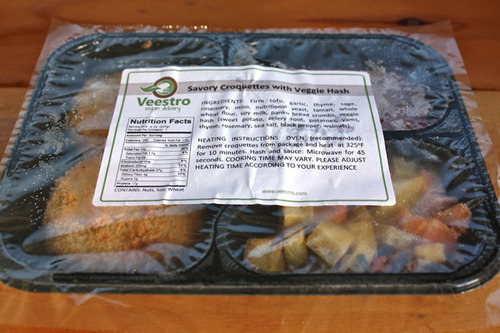 Veestro meals are not only nutritious, but a delight to your palate, wallet & time. Our meals are prepared using all-natural ingredients, without GMOs, chemicals or preservatives, to ensure the freshest home delivery meals around. We have created an eclectic variety of gourmet meals to please the whole family. Mix & match with our create-your-own meal plan, keep children happy with our kids’ menu, & satisfy the exotic palate with internationally inspired entrees. Two days after I accepted Veestro’s offer a generous delivery arrived. I arrived home after a long day at work, followed by a quick stop at the gym, to a very large box on my doorstep. At first I was confused, I hadn’t ordered anything online, had I? Then I read the shipping label – Veestro! But I was worried, how long had it been there? Had everything melted/spoiled? Nope. Thanks to their dry ice pack, everything was frozen & intact. And by generous delivery I am talking a week’s worth of soups & entrees & even desserts! Of course, the first thing I dove into were the “Raisin Nut Cookies” before any thought of taking photos or tasting notes! I do remember that I enjoyed them, & they were crisp & not too sweet, as natural fruit juice is used as a sweetener. The first entree I tried was “Savory Croquettes with Veggie Hash.” I’ll admit I chose it because it sounded a bit comforting. And I love comfort food! I really didn’t know what to expect, & may have even kept my expectations a bit low, but was more than pleasantly surprised at how tasty this was! The croquettes – made of tofu, nooch, tamari, miso, & spices & covered in panko bread crumbs – were scrumptious. Fluffy & almost creamy inside with a lovely herbaceous flavor, & a crunchy breaded texture outside. My only complaint is that there weren’t more than two (although, I was completely satisfied hunger-wise, I just enjoyed then that much!). The croquettes were served on a bed of tender “veggie hash” comprised of sweet potatoes celery root, yams, potatoes & spices, along with a tangy, spicy red sauce made from tomatoes, onions, peppers, jalapenos & spices. Deeelisshhhh! 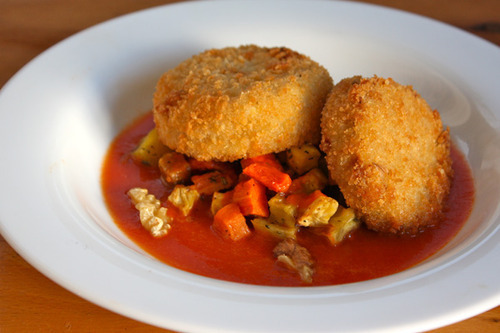 While listed on their website as an “appetizer” I ate this as a light dinner & found it to be the perfect portion, & it was a cinch to prepare – the croquettes baked for 10 minutes in the oven, while the veggies & sauce required only a quick zap in the microwave. The next dish I tried was the soba noodle salad. 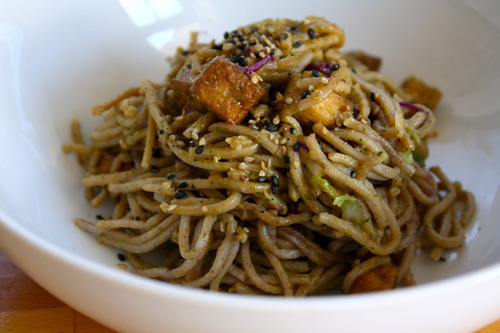 I absolutely love a soba salad & make sure to have buckwheat noodles in my pantry at all times. I loved the convenience of one of my favorite things packed up & ready to go – no boiling of noodles or chopping of veggies – just a quick defrost & dinner is ready! This dish combined seasoned firm tofu, Napa cabbage, scallions, sesame seeds with soba noodles smothered in a velvety sweet & slightly spicy peanut sauce. I usually prefer my noodles with a bit more veggies, & it would definitely be easy to bulk up the vegetable content depending on your preferences – more cabbage, shredded carrot, broccoli, snow peas, pea shoots, etc. However, for a quick, on the go meal, it is tasty enough as it is. Finally, I enjoyed a beautiful slice of cheesecake! Who doesn’t love a slice of rich & creamy vegan cheesecake? An indulgence that doesn’t happen as often as I’d like! My Mom is known in our family for making the BEST (dairy based) cheesecake, & I’ve been dying for her to perfect a vegan version. It’s hard to get the texture just right, but with all the new vegan cream cheeses on the market, perhaps we’ll hit the mark soon. 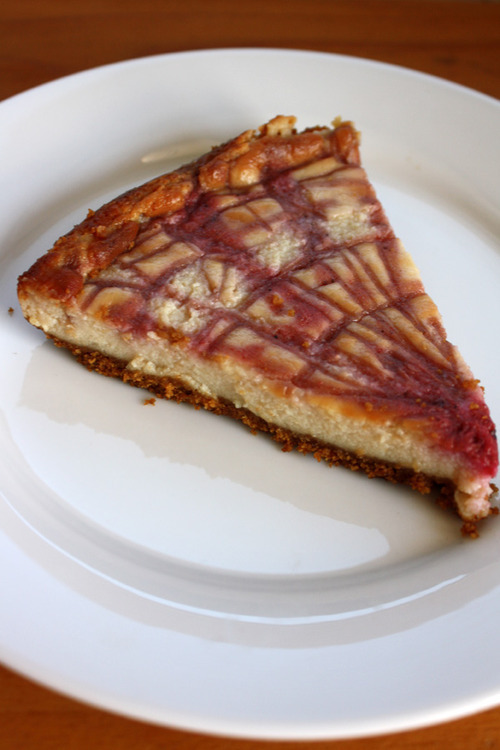 This cheesecake from Veestro was creamy & light with a tangy raspberry swirl & graham cracker crust. It did not boast the silky, creamy texture of a dairy based cheesecake, rather, as it was tofu based, it had a more “spongy like texture,” but it was pretty darn good. And as I don’t often have cheesecake lying around, it was especially awesome to pull this out of the package & enjoy! Can you believe that Veestro sent me more that this? I still have a few soups, veggie meatloaf & lasagne to try! I’ll be back with part 2 soon, & will review the nutritional content & cost then as well. Until then visit veestro.com to see all of their dishes & delivery options!